Harajuku! Another place I went to the most other than Shibuya. I think I went to Harajuku about 3-4 times. Like Shibuya, this is another popular tourist spot with many tourists and it can get super crowded on a weekend. Just look at the insane amount of people walking down the street! And this was on a weekend. Takeshita-Dori street actually reminds me of a place in Hong Kong called "Mong Kok" 旺角 with a lot of shops lined up all in one street. They say you can find a lot of cheap stuff here but I don't know how true that is as I still find some of the stuff they sell here to be rather quite expensive. Maybe just cheaper than other places in Tokyo, lol. I don't really quite like the "Harajuku" fashion they sell here as it is more of the over dramatic side for me. Bright rainbow colours and unicorns? I think I'm getting too old for that! XD I went to Takeshita-Dori street mainly to shop at the Daiso (major dollar store) and eat fries at the Calbee+ store and take purikura pictures. I'll talk more about my experience with purikura photo booths in another separate poster later. DAISO! I spent about $50 here buying random things from like bento boxes and decorations, food, supplies and household goods. Everything is soooooo cute and cheap here, omg! There is 4 floors and I could literally spend a whole day here and could possibly shop here everyday too! XD Taking pictures and recording videos inside was not allowed so I don't have pictures to show you what it looks like inside. But I can tell you they have just about anything you would want to buy from candies, makeup, food, furniture, Japanese goods and the list is endless. You can just find about anything and everything here, even things you would not expect to find at a dollar store. The end of the Takeshita-Dori Street. Found this crepes store at corner of the end of the Takeshita-Dori Street. Didn't get to try it, perhaps next time! Now to the other side/area of Harajuku on Omotesando street. I stopped by to the famous The Gindaco shop to eat their takoyaki which is located at the very front corner of Omotesando street. It was the best takokyaki that I had! SoftBank! A popular cellphone company store in Japan. I like how that guy is just standing in front of the store so casually with those super shiny shoes he has on, lol. Tokyu Plaza! Didn't get a chance to go in there but I just like how all the people are randomly posing like a model while waiting for the lights to cross the street, especially that guy in the black suit! LOL. 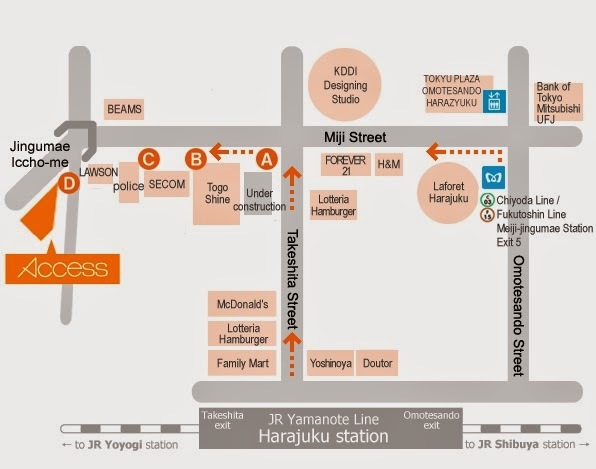 Here's a map of the Harajuku area which is actually very easy to navigate around. I was even able to find short cuts to get to the places I want to go to after walking around the area once.